There’s something about the shape of a classic two door car that attracts the eyes like little else; Jaguar found that with the E-Type, Ferrari with the GTO (and pretty much every one of their cars!) and Australia’s Holden did it with the Monaro. July of 1968 saw the release of the first “two door pillarless coupe”, with the HK Kingswood losing two doors, gaining a redesigned roof and kickstarting a legend, with the release of the Monaro. There were three models; the base, the GTS and the GTS 327. 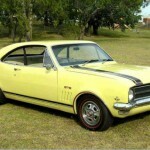 The entry level model came with Holden’s trusty 161 cubic inch cylinder engines with the GTS offering the 3.0L or 186 c.i. with standard or 186S engines. Naturally enough, the GTS 327 came with the Chevrolet 327 V8, with 186kW or 250 brake horsepower. Engineers originally claimed the engine bay was too small to hold the American iron, fastracking development of an Australian designed and built V8, however a remeasuring found the Chev would slot in nicely. 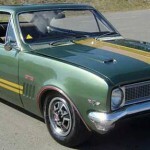 The HK Monaro also provided Holden with their first victory at the Bathurst 500 race, with Bruce McPhee and Barry Mulholland (piloting the car for just one of the one hundred and thirty race laps) backing up the pole position and fastest race lap. The HK was distinguishable by the narrow, American influenced tail lights and a short vertical/wide horizontal bar in the grille. 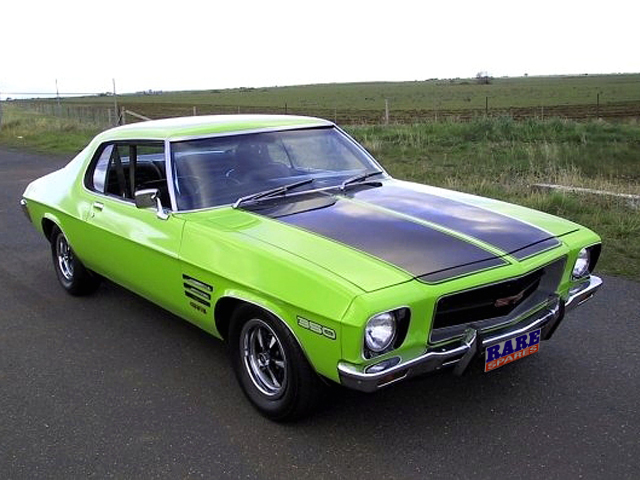 Barely a year later the facelifted HT Monaro arrived on the scene. The 327 was dropped in favour of the 5.7L 350 cubic inch and the HT saw the addition of a two speed Powerglide automatic. The hairy chested V8 had 300 ponies (224kW) in manual form and was slightly detuned for the auto. The HT also saw the introduction of Holden’s own 4.2L and 5.0L V8s plus, later in the HT’s life, the three speed Trimatic automatic. The grille was updated with the addition of a plastic, multi slatted design and increased in size tail lights, plus the addition of a round speedometer, replacing the strip style. Go faster stripes,available on the HK and located on the driver’s side, were relocated to running down the centre of the HT. Looking good but performing no real function were two air intakes on the bonnet. Rubber bushes in the suspension replaced the sintered bronze bushes found in the HK. 1969 also saw the formation of the fabled Holden Dealer Team; put together by racer and engineer (the late) Harry Firth, the team featured rally ace Colin Bond, McPhee and Mulholland, Tony Roberts and a young, almost untried driver named Peter Brock. 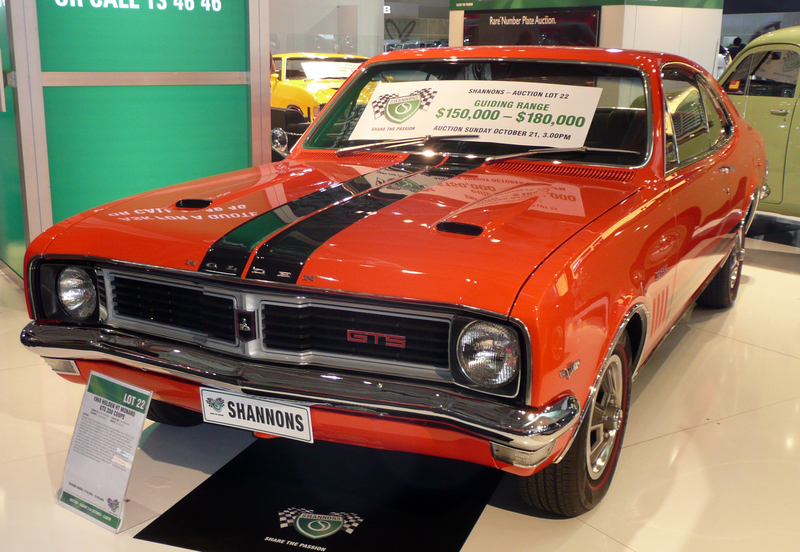 1970 launched a new decade and the HG Monaro. External changes were mild; the grille was separated into two part, taillights were modified slightly, some badging was added and chromework reduced. At the front of each fender was a bold “350” decal, to stamp its authority on the road. The non 350 powered GTS had a softer suspension, improving the ride and disc brakes at the front were added as well. The HG would also be the last of the smoother, rounded design before the release of the HQ. 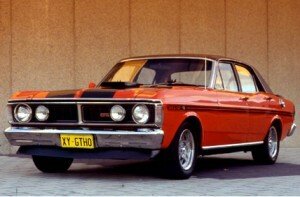 1971 had the world watching their tv sets to see what was happening in Vietnam and the HQ Holden was released as well. 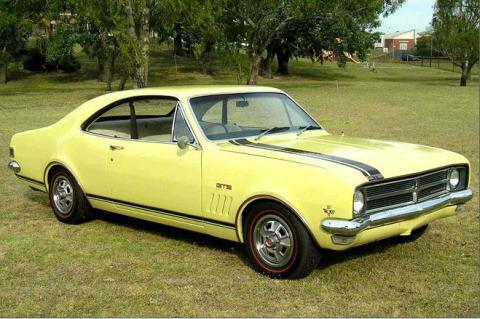 A sleeker, more angular design, the HQ Monaro had a completely different profile yet had the family resemblance; a larger rear window and squarer rear quarter window seemed to ease the sporty look, with the design now seen as one of the best to come from an Australian design studio. 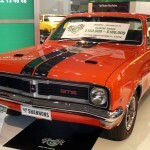 There was a change of engine and name specification, with the GTS nomenclature being V8 only. There was the addition of the LS range,with engines from 173 c.i. in the entry level non LS, through to the 3.3L or 202 c.i. six and above for the LS. From the start until 1973 the HQ had no body striping, plus, with the HQ Statesman luxury vehicle also being fitted with the 350, there was a perception the range wasn’t as sporty as before. The three speed Turbo-Hydro automatic gearbox also was seen as a dulling of the range, at the time. Adding to the spice was the change to a smaller car for Holden’s main racing duties, the Torana. 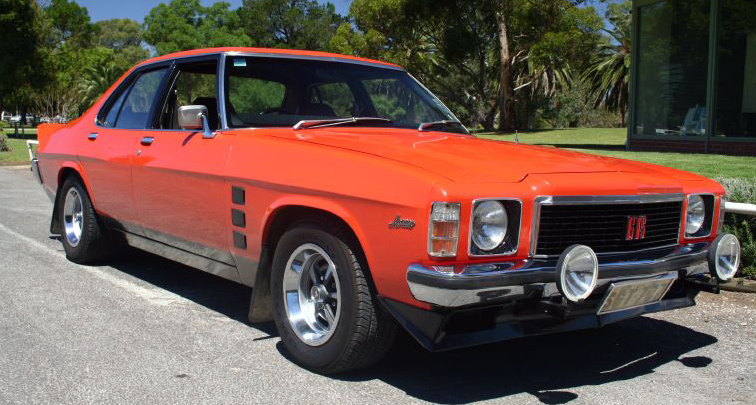 It wasn’t until 1973, with the release of the first four door Monaro GTS that body striping was added to the HQ range, possibly in an effort to clearly differentiate between the Kingswood and the Monaro. A final kick in the pants for the Monaro faithful was the deletion of the 350 decals, being replaced with a generic V8 bootlid badge. In 1974, the final year of the HQ, the manual version of the 350 was discontinued and the engine itself was shortly after deleted from the range, along with the slow selling auto. The facelifted HJ continued the Monaro name, with leftover HQ two door bodyshells being fitted with the HJ’s squared off front end whilst the four door GTS became a model in its ownright, with the HQ GTS being an optioned up Kingswood. The GTS also came with either the 253 c.i. or 308 c.i. engines as the 350 c.i. and entry level coupe were discontinued, however the LS was continued with the 3.3L. Just 337 LS coupes were produced, making them one of Australia’s rarest production cars. The GTS coupe was discontinued with just over 600 examples produced. Of note though was the ability to option in bodywork in the form of front and rear spoilers. 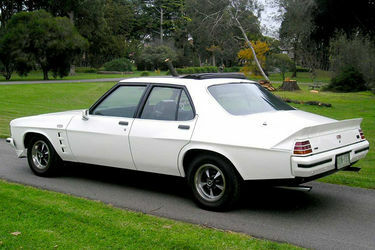 Mid 1976 saw the release of the HX range, effectively a mild facelift and also effectively the end of the Monaro nameplate. 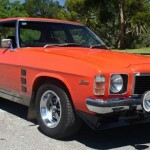 Alongside the four door Monaro GTS sedan, there was the release of the specced up LE two door pillarless coupe, complete with glitzy gold wheels and leftover eight track cassette players, plus emission controls for the engine. 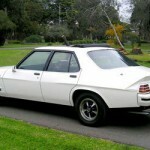 Late 1977 had the Holden GTS released, complete with four headlight grille, disc brakes all round, front and rear spoilers as standard, the introduction of Radial Tuned Suspension and the 4.2L as the standard powerplant, being shuffled aside in June of 1978 in favour of the 5.0L. At the same time, Holden had also released the Opel based Commodore, with the then mid sizer ending the run of the GTS in December of 1978. The HZ itself was phased out in 1980. In the late 1990’s, Holden designers produced a concept car; based on the Commodore of the time and shown at the Sydney Motor Show in 1998, the media quickly christened the coupe concept as a Monaro and such was the public interest the car was put into production. Available as the CV6 with a supercharged 3.8L V6 or CV8, featuring Chevrolet’s 5.7L V8 and with six speed manual or optional four speed auto, the CV6 failed to ignite and was dropped soon after introduction. 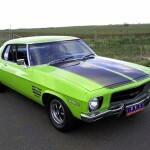 The car would also be sold as a Pontiac GTO, with styling changed at the front to suit the American market, plus the Monaro was updated front and rear in line with the introduction of the VZ Commodore. 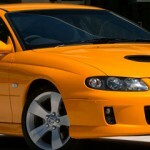 Public interest quickly waned, however, with export markets drying up and some questionable styling changes affecting public perception overseas, the final Monaro was sold in February of 2006. Various racing versions including a 427 c.i. 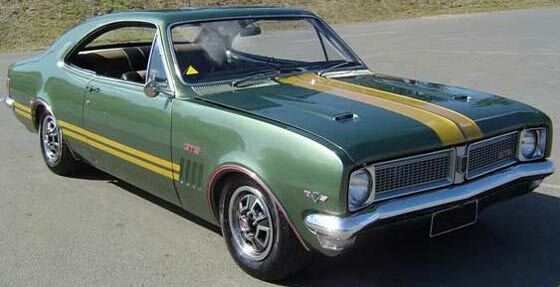 powered car were raced whilst Holden Special Vehicles released their own under the name of Coupe, not Monaro, including a limited run all wheel driver version. With Holden discontinuing local manufacturing by 2017, it’s exceptionally unlikely that the Monaro name will ever be seen again on a Holden badged vehicle. How Far Can You Go On One Tank? I don’t know about you, but I’m always trying to go for as long as possible in between trips to the bowser. 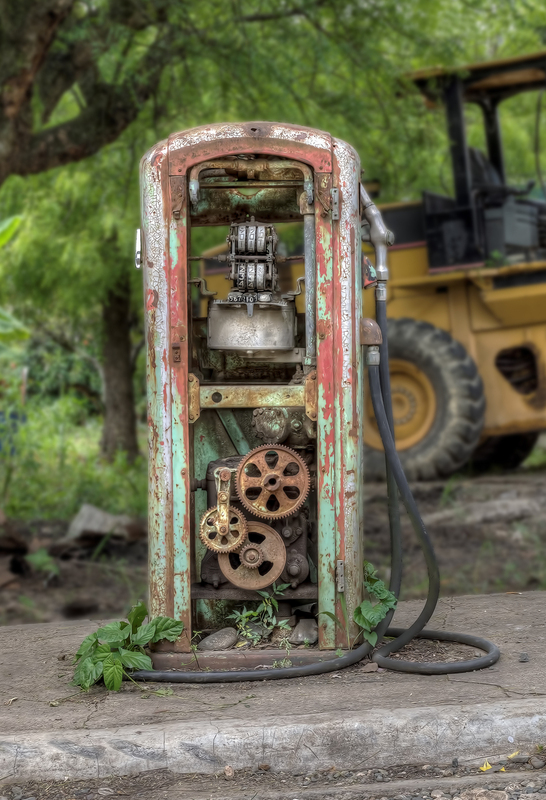 There are a number of ways of eking out the fuel and minimising your fuel consumption, but how far can you go on just one tank? According to the Guinness Book of Records for 2014, the furthest you can go on one tank of fuel is 2545.8 km, which was achieved by a pair of Croatian drivers named Marko Tomac and Ivan Cvetković. They were driving a Volkswagen Passat 1.6 TDI Bluemotion which was not modified and had to carry two people plus their luggage. This is the second time that the Volkswagen Passat 1.6 TDI Bluemotion has picked up a world record for hypermilage, as the pair of British drivers who held the record busted by the Croatian team also drove one of these super thrifty little beasts. Drivers watching their petrol pennies take note. Crunching the numbers reveals that this adds up to 32.2 km/litre, which is the equivalent of 3.10 litres/100 km. As the drive was made over a variety of roads in Croatia, we can presume that this is combined fuel economy. The little Passat also holds the record for the world’s best fuel economy for non-hybrid cars, with a team of two US drivers clocking up 3.10 L/100 km on average as they drove through all 48 of the contiguous states in the USA (i.e. not Alaska or Hawaii), a trip that took six fuel top-ups and 13,071 km. However, for the same drive, the record holder overall (i.e. with hybrid cars included) is a 2006 Honda Insight , which managed 3.16 L/100 km. Kia Optima hybrid), the rest of us have to be realistic. Little hatchbacks just won’t fit our lifestyles and our families. But we still want to save a few cents at the bowser. What can we do? Well, there are a few things. Watch what you’re carrying as luggage. The official records required the cars to carry two people plus luggage to make the comparison fair. This is because every 25 kg increases your fuel consumption by 1%. Keep the air-con off. The air-con is powered by your engine. Opening the windows is a thriftier option, until you get up to higher speeds. On the open road, having the windows down creates more drag and reduces aerodynamics, thus making you burn more fuel. Drive smoothly and without aggression. Pick the right gear to keep the revs at their most efficient. If you can select your drive mode, put it on Eco. Most cars with selectable modes have the Eco option. Whip off the roof rails if you don’t use them. Obviously, if they come as standard fitted to the car, you can leave them on, as removing them may damage the vehicle and they will have been designed to be aerodynamic. But ski pods and the like shouldn’t live up there full-time. 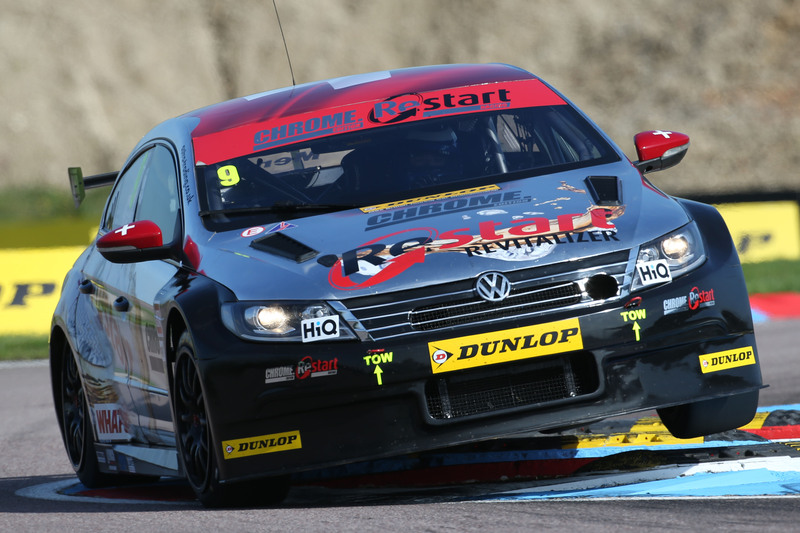 Keep your tyres at the right pressure. All tyres leak. If you want to see the difference between fuel consumption with a flat tyre and with a properly pumped tyre, get a bike. Let a bit of air out of the tyres and ride around the block. Now pump the tyres back up and ride the same circuit. You will feel the difference. The words “household name” get thrown around loosely at times, however in the late 1950s through help me with my homework to the 1960s it was hard to not know of Jack Brabham. 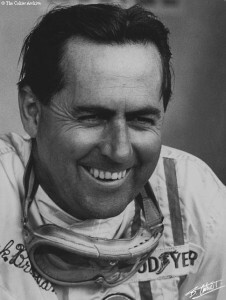 Knighted in 1979, Sir Jack Brabham passed away at home on the morning of May 19, at the Gold Coast in Queensland, aged 88. Born in the Sydney suburb of Hurstville, April 2nd 1926, John Arthur “Jack” Brabham was exposed to the automotive field very early; at the age of 12 he’d learnt to drive the family car and trucks of the grocery business his father had. He studied metalwork and technical drawing, before moving into a duopoly of study (evening course in mechanical engineering) and daytime work at a garage. On the 19th of May, 1944, he enlisted into the Royal Australian Air Force, becoming a flight mechanic, contrary to his wish to become a pilot however there was already a surplus amount of aircrew. An American colleague, Jonny Schonberg, persuaded him to watch a category of racing known as midgets. Popular at the time, it was enough to have Jack interested and he built a car and engine which Schonberg raced. After Schonberg’s wife stepped in, Brabham took over and won on just his third night of racing. He won the 1948 Australian Speedcar Championship, repeated the feat a year later and also added the South Australian Championship plus the 1950 and ’51 silverware. 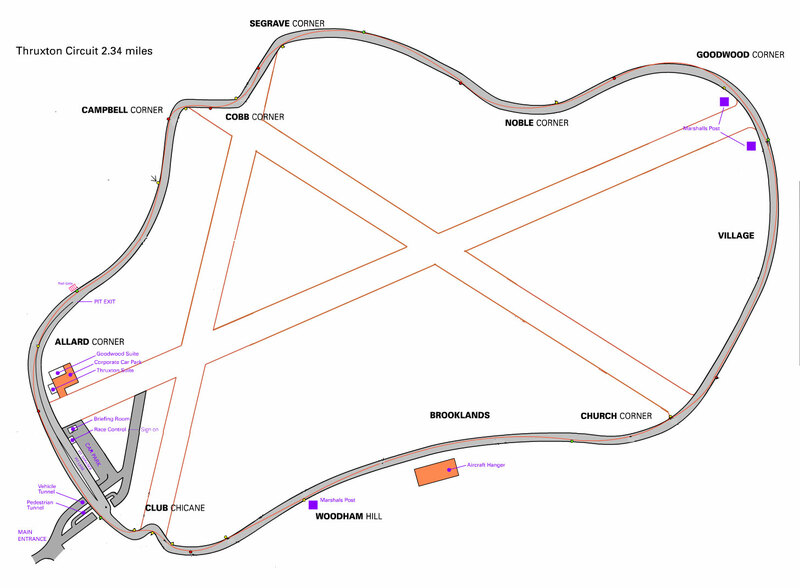 From here, Brabham became interested in road racing, buying and modifying cars from the Cooper Car Company. He raced in Australia and New Zealand until 1955, picking up the nickname Black Jack along the way. After competing in the 1955 New Zealand GP, Jack went to the UK to try his luck there. He drove an ailing car in the 1955 Grand Prix, retiring with a broken clutch. It was also around this time that the Brabham and Cooper name became intertwined, with Brabham working with the Cooper factory and racing their cars, including the Formula 2 category. 1959 saw the Cooper cars receive a power boost with the addition of 2.5L engines to the company’s team, with immediate results for Jack, winning the 1959 Monaco GP and the British GP after a tyre conservation drive saw him win ahead of rival and friend Stirling Moss. It came down to a close championship fight between Brabham, Moss and Ferrari’s Tony Brooks, with Brabham running out of fuel and pushing the car across the line for fourth. It was, though, still enough to get the required points. Brabham, being as competitive as always, though teh cars and he could do better; he asked his friend (another soon to be Aussie legend) Ron Tauranac, to come and work with him in the UK. Brabham and Tauranac worked side by side in upgrading and selling cars via Brabham’s car dealership but it was in racing that their future lay. With advice from Ron, Brabham took a Cooper car, helping to designthe Cooper T53 and took the car to five successive Grands Prix victories, including the Belgian Grand Prix, where Stirling Moss was injured retiring for two months to recuperate) and two others were killed. Tauranac and Brabham formed Motor Racing Developments, racing a Cooper before moving to a team he created in 1962 and racing cars powered by the FIA’s choice, a 1.5L powerplant. There was no success that year and little at all before 1966 saw a change to 3.0L engines. The other teams had unwieldy and unreliable 12 cylinder engines; Jack persuaded Australian company to help develop a V8, based on the American Oldsmobile alloy block. 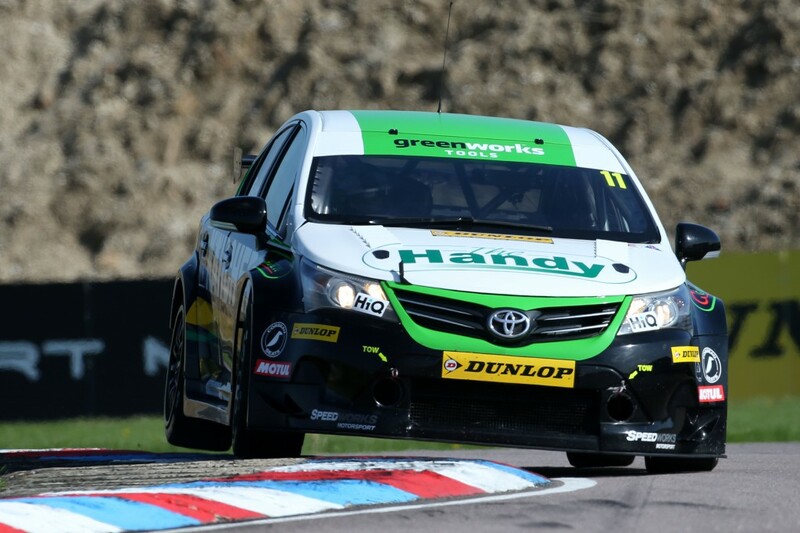 It was a proven engine which would give better reliablity, allowing them the advantage and the other teams catchup as they struggled to make their engines reliable. This would end up creating a piece of history that still stands; with Ron Tauranac and Brabham building the BT-19 car, powered by the Repco 3.0L V8, Brabham won the French Grand Prix, becoming the first ever driver to win in a car of his own construction. He’d win four races straight, becoming the first and only driver to win a championship in a car bearing his name. Jack was 40 in 1966; stung by media questioning his ability, he’d uncharacteristically recated by appearing in a beard and hobbling to his car with a cane at the Dutch Grand Prix. To rub it in, Brabham won the race. 1968 was the beginning of the end for Brabham’s racing career; retirements in the first seven races, minor points in the German GP and then four more retirements. In 1969 Jack suffered injuries to a foot in atesting accident and told his wife he’d retire at season’s end, selling his share of the team to Tauranac. Having found no decent enough drivers to race in his team in 1970, Jack postponed retirement, winning in his first race. After some good finishes he did retire at the end of the season. Jack stayed busy in retirement; running his cars at events such as the Goodwood Revival, saying racing kept him young. His first wife, Betty and he had three sons; David, Geoff and Gary.In 1994 Betty and Jack divorced, with Brabham remarrying in 1995, to Margaret. But by the mid 2000s, health issues started to creep in. He was almost completely deaf thanks to the years of racing without the protection today’s drivers take for granted, there was kidney dialysis and macular degeneration in the eyes. Brabham’s achievements though were being acknowledged, with a suburb in Perth being named Brabham and an extension to the Sydney Motorsport Park (formerly Eastern Creek Raceway) taking the full length to 4.5km and being called the Brabham Circuit and an automotive training facility was opened in Queensland in 2012, being named the Sir Jack Brabham Automotive Centre of Excellence. 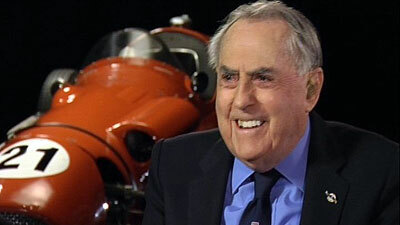 Sir Jack Brabham made his last public appearance just one day before his passing, with one of the cars he had built. 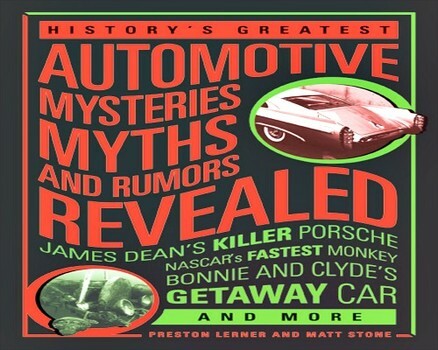 In my blogs over the last few weeks, I’ve been drawing inspiration from a fantastic book picked up by chance from the local library: History’s Greatest Automotive Mysteries, Myths and Rumours Revealed by Preston Lerner and Matt Stone. It’s such a fun read and is bound to be interesting to most visitors to Private Fleet, so I thought I’d better let you all know about it so you can read it for yourselves. The book takes a look at some of the most popular stories circulating in the automotive world, then takes a long hard look at whether the stories are true or not. The authors have done their homework pretty thoroughly, it seems, almost like the Mythbusters but in print. The book is divided into six sections: Urban Legends, Crime, Racing, Hollywood, Death and Inside the Industry, with the various popular stories to be investigated being slotted neatly into one of these categories. This structure makes it very easy to pick up and put down, and you can dip into it wherever you fancy. As well as the main stories, the authors have included boxes with little extras and tangents – such as the development of the Batmobile for the 1960s TV series, which is included in the chapter about Model Ts coming in “any colour as long as it’s black” in a box entitled “Born To Be Painted Black”. The Darwin Award-winning Chevrolet Impala fitted with JATO rockets that crashed into a cliff in Arizona at 350 mph, 125 feet in the air – did this really happen? The Hyundai driven by Rodney King when he was beaten up by the LAPD goons, triggering the Los Angeles riots in 1991 – was he really speeding at 115 mph? Did Bonnie and Clyde send a letter to the Ford Motor Company thanking them for making the perfect getaway car? 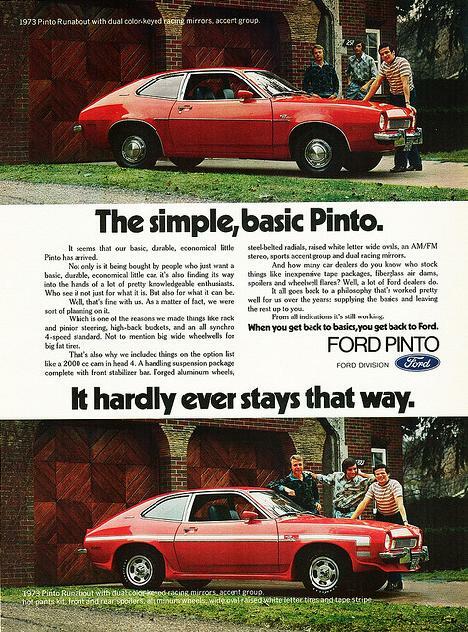 Would the notorious Ford Pinto been capable of flying if it had wings fitted? Yes, that’s flying with an L not frying – what the Ford Pinto became better known for. Did the people who bought bits of the Porsche 550 Spyder that James Dean was driving when he crashed experience chronic bad luck and disaster, suggesting that the car was cursed? Did Steve McQueen drive all of his own automotive stunts in the iconic car chase scene in the 1968 thriller movie Bullitt? Who really won the very first Indy 500 race? Was it actually Ray Harroun (who is credited with the win) or was it Ralph Mulford? Has a monkey called Jocko Flocko won as many NASCAR Grand National races as Mario Andretti? And if you add wings, can it fly? And the answers to all of these questions? Well, for that, you’re going to have to read the book yourself. Disclaimer: The writer and Private Fleet are not associated in any way with the authors or publishers of this book. Czech Mate: Skoda Octavia Ambition Plus sedan. It’s a sad, sad, situtation, sang Elton John, about what I don’t know, however, for A Wheel Thing, it could apply to having a major manufacturer having two cars so very close to each other that one of them is potentially superfluous. Hyundai has the Accent (a nameplate used to deflect hangover angst about the unlamented Excel) and the i30. They’re both very similar, down to the previous model i30 looking almost exactly like the current Accent. A Wheel Thing spent time with the 2014 Accent SR and asks why the Accent is still here. It’s a five door hatch, the SR supplied was in a smooth metallic grey and funky looking alloys inside 195/50/16 Kumho rubber, has LED daylight running lights sweeping around and under the slimline headlights and the long, vertical tail lights that neatly integrate into the sheetmetal and sweep into the roofline underneath a modest spoiler. There’s two solid crease lines,one from atop the front wheel arch and running to the reverse light section in the tail lights, the other breaking up the solidity at the bottom of the doors. It’s not unattractive, with the ID subtle by having a single SR badge on the hatch lid. At the front there’s the signature, subtle, hexagonal imprint in the design, flanked by a pair of cornering lamps. Lay the profile side by side with the previous i30 and you’d be forgiven for thinking they’re twins. The Accent hatch is 4115mm long x 1700mm wide by 1450mm in height, wheelbase is 2570mm and front/rear track is 1493/1489mm. Under the bonnet is a GDI (gasoline direct injection) 1.6L four potter, offering 103 kilowatts and 167Nm (6300/4850 revs respectively) through a six speed manual (in the test car supplied, auto available) with a slightly lower spec available with the MPI (multi point injection) power plant. It’s a slick gearchange, with no real weight but just enough to give feeling whilst the gate is a touch close with first and third sometimes becoming the gear selected but not wanted; more often than not it was third when I wanted first. Clutch is well synchronised in its pressure and pickup point, offering the chance to move the lever quicker through the gate at higher revs. It’s a competent package all round, but the lack of torque is noticed against the 1600 odd kilo gross vehicle weight. Hyundai quotes 6.1L/100 km (combined) from its 43 litre tank, which seems pretty much on the mark. The interior is basic but functional, centred around a matt coat five inch touchscreen for radio and auxiliary inputs. Not unexpectedly, with Hyundai’s continuing focus on build quality, it’s ergonomic, a good mix of plastics to the look and touch, with a simple yet effective sweeping design to the dash. Aircon controls are the same, simple yet effective, with colour coding for temperature and icons for the speed and direction. The driver’s view is as equally simply effective, with two no nonsense dials for revs and speed bisected by a monochrome LCD display for fuel and temperature with the steering wheel also basic with minimal controls, limited to audio and cruise with Bluetooth phone controls attached to the buttons around the touchscreen. Seats are cloth trimmed, manually adjusted, well padded yet not as snug on the support to the body. Cargo space is considerable for the size, with up to 600L available. On the road the Australian refined suspension is noticeable, with subtle refinements to the McPhersion strut front/torsion bar rear, providing a smooth and refined ride. Powered through some roads that are tight, twisty, off camber, the Accent surprises by being nimble, adhesive, flexible, rarely unflustered by sudden directional changes, absorbing the bumps and transmitting little through to the cabin. Steering input is somewhat numb however, with no real information feeling as if it’s been transmitted back to the driver and brakes haul up the Accent nicely and minimal fuss. The Kumho tyres are fairly quiet on coarse chip road surfaces and the overall feeling is of quiet control. The reason A Wheel Thing queries the need for the Accent is this: the i30 offers a 1.6L diesel or petrol 1.8L and 2.0L, with the 1.8L not providing that much extra torque or power. Overall dimensions (4300 x 1780 x 1470mm) are again barely different from the Accent; weight is lighter in the Accent (i30 is 1850 kg GVM) and fuel economy really isn’t that much different for the i30, being an extra litre per 100km quoted. The overall feature set in the i30 (http://www.hyundai.com.au/vehicles/i30sr/specification-range isn’t enough to really differentiate apart from a 7 inch screen and some interior design touches. So, Hyundai, why keep the Accent, especially that in your normal passenger range it’s this or the Elantra (another confusing entry to the Hyundai passenger range given the i30’s quality), not the i something nomenclature. With a sedan available in both levels (i30 and Accent) also, the Accents stacks up against the i30 with no seemingly obvious (to A Wheel Thing, at least) need to have it. Regardless, it is a good car and info can be found here: http://www.hyundai.com.au/vehicles/accent/specification—range At the time of writing Hyundai have factory pricing specials so contact your Hyundai dealerfor information. There’s a persistent story circulating around the automotive world that Henry Ford said that the original “Tin Lizzie” (Model T Ford) could come in “any colour as long as it’s black.” Certainly, if you catch a glimpse of a lovingly restored (or maintained) Model T at a car show or in a museum, you’re probably going to see a black one. But did Henry Ford actually say this? Was black really the only colour that traditional Ford cars came in? Sorry to bust everybody’s bubbles of belief, but this is more or less an urban legend. Model Ts didn’t just come in black. Mostly black, yes. But all black, no. According to one fairly well researched book on automotive history I came across lately, Ford used a number of different colours throughout the years. These days, you get several colour choices for your model, with slightly different colour choices for each different model in the marque. For example, the current line of Ford Fiesta comes in light blue, cobalt blue, white, black, orange, silver, medium grey and red. The Ford Territory, on the other hand, comes in dark red, bronzy brown, three different shades of grey, black, white and blue. 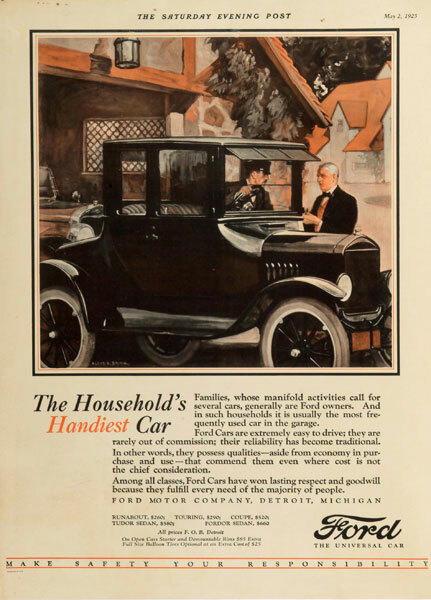 Ford used to do this sort of thing right at the start of its production history. 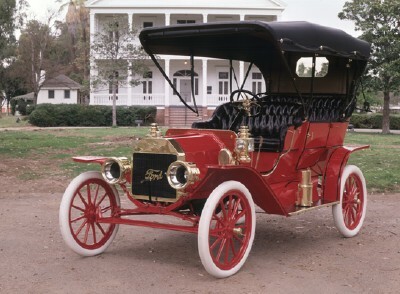 In 1909 to 1914, Fords came in red, green, grey or blue. However, from 1915 to 1926, only one colour was available, mostly as a cost-cutting exercise. Hands up who can think what might have happened in 1915 that required businesses to cut back on costs? Well done to those who answered World War I and extra bonus marks to those who mentioned the influenza pandemic. After these global crises were over and people had a bit more money to burn – and when Ford’s competitors started offering a few more colours – colour came back to the Ford factory floor in Detroit. In 1926, green came along. In 1927, a veritable rainbow rolled off the production lines, with two shades of maroon, four shades of green, brown, blue and grey being on offer, alongside a colour that experts call “moleskin” – which sounds like a sort of black. The reason why the story about Tin Lizzies coming in “any colour as long as it’s black” is because the main production years for the Model T was in the 1915–1926 period. Model Ts may have been basic black but they were cheap, which made them very, very attractive in the postwar period. They were probably a real godsend for the various social workers of the time across this tricky time: doctors could rush to seriously ill patients quickly with the motor car; vicars, district nurses and the like could do the rounds and bring aid to the folk they were responsible for more efficiently. As to whether old Henry Ford actually said the thing about any colour blah blah blah, this book I got hold of is silent. He may have done during the black period of the Model T. But it wasn’t company policy or part of the image of the Model T. It wasn’t born to be black from the beginning. And if you’re very, very lucky, you can come across some of the gaudier models out there. Back to the Future: Ford Signs Off With the Last GT. 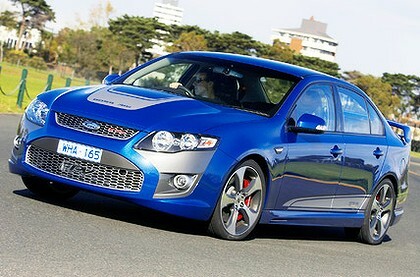 Although Ford Australia will cease local manufacturing in the next couple of years, it hasn’t forgotten about its history; with a nostalgic nod to the past, Ford has resurrected, for the final time under Australian making, the iconic GT moniker. There’s also the return of the three fabled numbers, 351. In this case, rather than the brawny 5.8L V8, it’s a supercharged 5.0L with 351 kilowatts. Having said that, the engine will need to rev to a stratsopheric 6000 rpm, just a few hundred more and with some in reserve compared to the carbie fed monster of forty years ago, when GT became a byword for pure, unadulterated grunt. The one that really fired up the GT legend. Seconds to last in a line of legends. There’s no lack of grip, with 275/35 Dunlop Sports Maxx tyres wrapping 19 inch diameter alloys, plus Ford are adding a launch control feature; braking comes in the form of Brembo 6piston calipers at the front and four pots at the back. The exterior is apparently going to be a “hark back” to the heady days of the 1970s, with a black stealth highlight design to complement the five colour range (white, blue, black, orange and dark grey). Compared to the now unbelieveably cheap price, for what the original GTHO was, of under $5000, this GT will come with a sticker price of $77990 (plus on roads) however there are rumours that the allocated run of 500 (plus 120 utes) has already been presold. About 40 years ago, the automotive world was struggling with the oil embargo imposed by the oil-producing Arab nations. People were turning away from the gas-guzzling muscle cars and looking for thriftier models. This was the economic and social climate that really helped the Mini take off and catch public imagination. But it also made people vulnerable to scams like the Dale debacle. 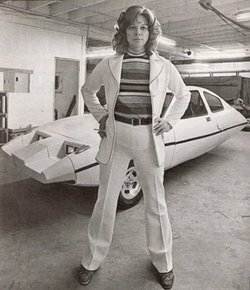 In 1974, newspapers and magazines were carrying articles (all based on press releases) featuring the “car of the future”: the Dale. The Dale was promoted very, very aggressively by someone called Liz Carmichael, who the press releases said was a widowed mother of five who planned on taking on the patriarchal automotive industry (this was the era of rampant feminism and burning one’s bra). 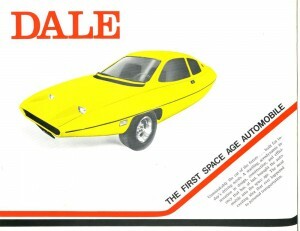 The Dale itself looked sleek and space-age and got people drooling – although the single rear wheel behind the two front ones looks downright weird today. It claimed to be able to do 70 mpg (3.36 litres per 100 km), have a top speed of 85 miles per hour (136.8 km/h) and to cost only US$1995. It was supposed to be built of super-tough materials that would withstand crashes and were nearly bulletproof. The reality turned out to be somewhat different. At first, the manufacturer of the Dale, Mr Dale Clifft, had actually been trying to create a more fuel-efficient vehicle, which he originally intended to be a sort of motorcycle. Then he met Liz Carmichael, who made Clifft an offer he couldn’t refuse. 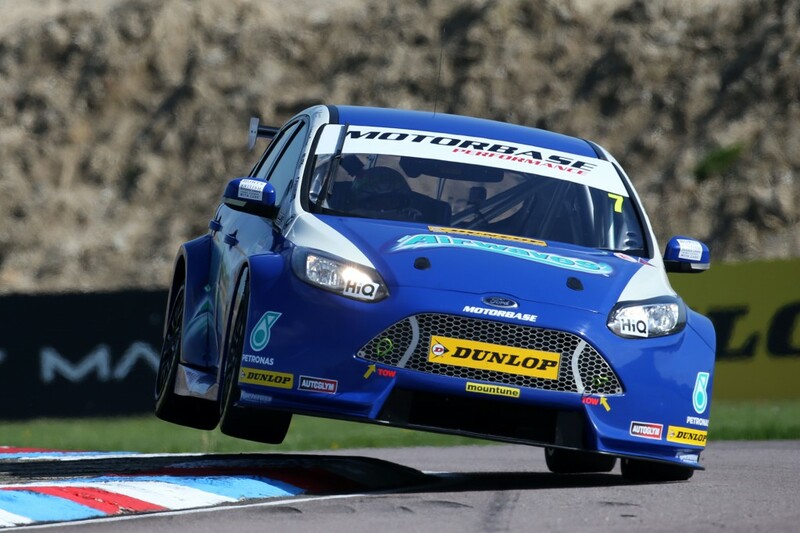 She started an impressive marketing campaign, putting out plenty of glossy and hyped-up brochures and sending press release after press release to the papers to drum up interest in the new Dale. The Dale looked impressive and sounded like the answer to everybody’s motoring problems (well, nearly everybody’s). Along with all the pre-release hoopla, there was also an invitation to invest in the company and buy shares in it. 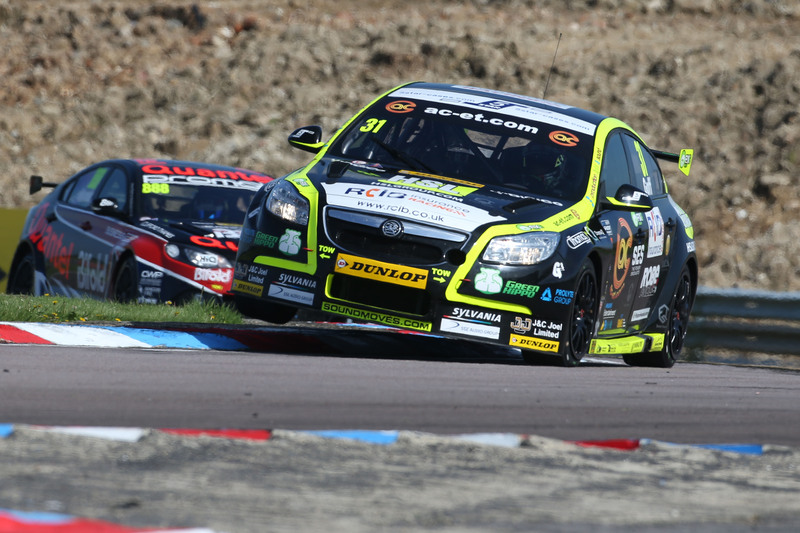 The money started rolling in for Carmichael and Clifft in the form of shares and early orders. Expectations were high on the part of the investors, the motor trade industry and motoring enthusiasts in general. A mock-up prototype of the exterior design was put on display at the Los Angeles Motor show. Naturally, after the revelations that the Dale was an utter fraud, the cops started closing in. They descended on the home that Carmichael was thought to have shared with her five children. What they found was an empty home, a bunch of wigs, heavily padded bras, depilatories and a fingerprint that proved that Geraldine Elizabeth Carmichael was actually Jerry Dean Michael, a convicted criminal who had been on the run in drag for at least ten years. The glamorous woman turned out to be more than just metaphorically ballsy. After a scandalous trial where Liz/Jerry tried to represent him/herself in court as being a pioneer like Henry Ford (with the small difference that Henry Ford actually had a car that worked rather than just an impressive shell). He/she skipped bail and went on the run again before finally being caught in the 1980s. And what happened to the Dale? The three mock-ups, which were little more than shells, now live in collections and museums in California. They are not exactly given feature spots.